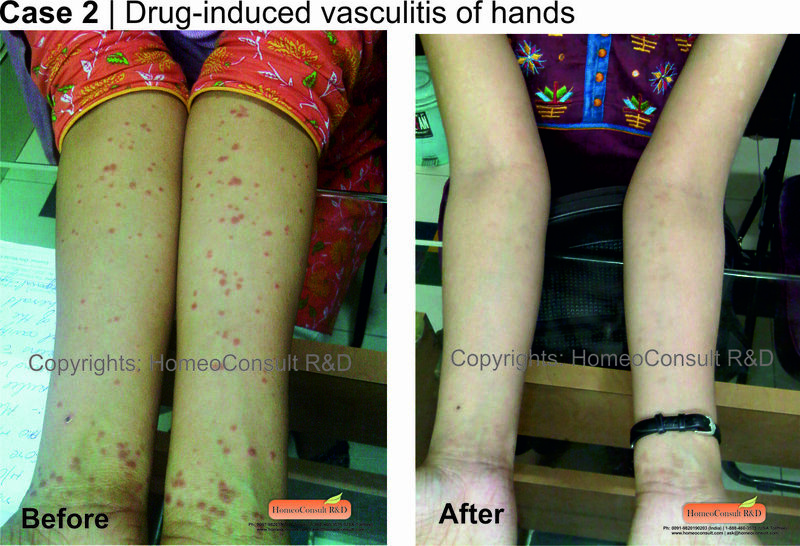 Leukocytoclastic vasculitis (LCV), also known as hypersensitivity vasculitis, typically involves inflammation of small-vessel and palpable purpuras (red or purple discoloration of skin) measuring 1-3 mm. In some cases the purpura may not be palpable and their distribution can be anywhere on the body. Immune complexes in the blood and a host of other auto-antibodies are involved in its manifestation. An identifiable cause can be found in half the cases, the remaining being idiopathic (cause unknown). Antibiotics, NSAIDS, diuretics, vaccines, infections, respiratory infections, HIV, allergens in food, Hepatitis c, Ulcerative colitis, Crohn’s disease etc are some known causes. The case photos shown here are of an young female who visited Dr. Anish Vaknalli with typical signs of palpable purpura and joint pains. Her symptoms had started soon after being administered antibiotics. She suffered from severe itching with lesions on her arms, back and legs. After carefully evaluating all her symptoms homoeopathic remedies capable of stabilizing her immune response were prescribed. Remedies commonly used are Lycopodium, Natrum Mur, Rhus Tox, Sepia, Bovista, Antipyrinum, to name a few. However, the remedy may vary since the etiology and presentation does vary in most cases and can be entirely different. Kindly abstain from self-medication. Also, since her condition was a result of a reaction to anitbiotics, a remedy capable of antidoting it homeopathically was also considered. She recovered and started showing improvements within 3 weeks of treatment. 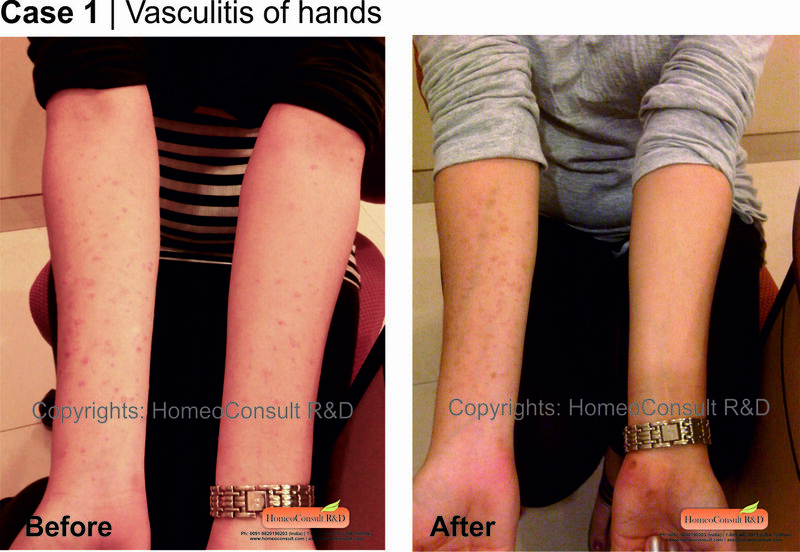 Ms. V presented with papular eruptions on her feet, arms and abdomen which itched and left blackish discoloration post the inflammation. It was spreading though she was prescribed some conventional allopathic medicines (presumably steroids). Her remedy was based on the totality of her present symptoms as well as based on her constitution which includes a persons personality, thermal activity, and functional response of our various systems to stimuli. She recovered within a span of 2 months. The treatment prescribed here first stabilizes the altered immune response. The inflammation, vasculitis and itching will first reduce, followed by lightening of the skin to its original color. The homeopathic medicines are prepared from natural plant and mineral sources and have no side effects whatsoever. Some may argue that the purpura eventually may subside on its own. Contrary to this belief, the patients treated here were suffering from this condition for over 4-6 months and the results achieved were immediate post the medication we administered. We can safely conclude that the treatment administered here by Dr. Anish Vaknalli has immense therapeutic value and should be opted for as soon as possible. Doc, amazing. You are the only homeopath who describes cases in such detail and helps build confidence in those wishing to opt for homeopathy. Keep up this good work sir. A student Homeopath. Hello, I wanted to follow up on this. The medicine has been working very well; I've only had a few outbreaks since I started taking it. The outbreaks are fewer in frequency and much less intense. I wanted to follow up to see if there were any further steps I should be taking. Thanks very much.